Last night’s Sleepy Hollw entitled “Heartless”, was all about illusions and seeing what you secretly want to see. A brilliantly written and planned out episode; and yet I can’t help but feel a little turned off about the end and what next week’s episode will be like. Though I’m getting ahead of myself. So let’s take a closer look at this episode and see just what’s in store for our favorite ‘Witnesses’. As I just stated, the theme of this episode was all about illusions and seeing what you secretly want; and the primary example of this comes from the episode’s baddie: The Incordata. Appropriately named “the heartless”, the Incordata is a type of succubus that is drawn to secret lusts and can play upon them by mimicking the intended targets desired love. Though it’s not just about a slight physical shape-shifting; but more about the ‘feeling’ or illusion it casts to make you think you’re with the person you want to be with. I particularly enjoyed the ‘twistory’ of this monster and how its first defeat came at the hands of the priest who would later be known as Saint Valentine. For whoever destroys the creature’s heart – which is kept apart from its immortal body – can wound and kill the creature. Though why summon a powerful succubus to feed multiple times in a night when one feeding can sustain a succubus for week? Well, as always, Henry and Moloch have much more devious plans for all that excess energy. As we predicted last episode, Moloch might have been removed from Katrina thanks to the Aurora Stone; but Henry was able to take that evil residue and condense it in a jar to bring Moloch into this world regardless. Though the baby Moloch is still quite vulnerable and growing like a normal child, so if there was a time to strike it is now. Though sadly, Katrina’s own hidden desires are what might keep her from acting. 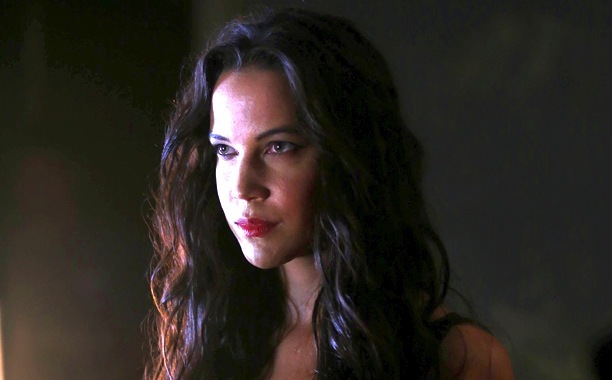 Throughout the episode we learned that Katrina feels that something has indeed been taken from her, which her and Ichabod both recognize as a possible sign of depression after losing the baby. In talking with Abbie later in the episode, Katrina reveals that she holds out hope for her son Henry/Jeremy because she has already lost so much and it’s all she can do to try to hold onto how she knew things in the past. These are exactly the emotions that could complicate matters for Katrina as she returns to Abraham’s side. Damn It Katrina! You had ONE job! After making him think that Ichabod left Katrina for Abbie – something a few fans would like as well – Katrina is accepted back into the Horsemen’s fold; but when she gets close to the baby Moloch, all she sees is a normal human child as opposed to the horrid demon spawn. It seems as though the necklace Katrina wears does more than just let her see Abraham’s humanity; but this child’s as well. Though does that mean there is SOME humanity in this child or is it just another illusion like the jar of rats/maggots that Katrina and Abbie saw earlier in the mausoleum? Considering the look on Katrina’s face, it looks like she’s bought the deception completely and will want to protect ‘her child’, which has me a little turned off – but I’ll get to that in a second. We knew there was a growing fancy between Abbie and Hawley, at least on Hawley’s part; but Abbie seems hesitant to open herself up. She sees where it’s gotten her in the past as well as how it has distracted Ichabod. Yes Hawley – like Katrina – is an important and powerful part of the team; but actually being with them would complicate things. Though whatever these feelings do or don’t mean for Abbie, they have improved Ichabod’s opinion of Hawley. 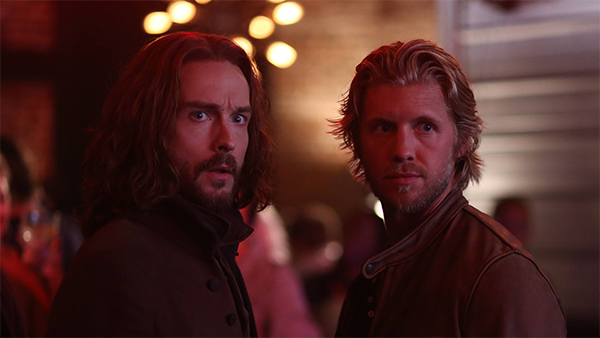 He sees that there is at least some deeper part of Hawley, and it’s a part of him that Ichabod can respect. Again, this was a great episode writing wise and the opening scene with Ichabod and Katrina watching The Bachelor was hilarious! Then again, the ending left me a little unsettled due to it seeming too familiar and ultimately pointless. We were told at the start of the season that we might start to not like Katrina as the Season progressed; and her constant idea to put herself in danger for no good is a recurring theme that goes no where as of the moment. The last time Katrina ‘stayed behind’, she wasn’t able to give Ichabod and Abbie any important advice; but was turned into the vessel for Moloch to be born. This time she went back as well with a mission; but has already been turned against it and might end up doing more harm than good. Additionally, next week’s episode looks to be an unrelated filler episode, so that just increases the frustration of all this tension not having a release anytime soon. We’ll see what happens; but this is the first episode of Sleepy Hollow that ended with me feeling uncomfortable about where they were going story wise. Only time will tell if Katrina can actually strike a blow for the side of good; or become a huge complication. Either way, Ichabod and Abbie are still the heart of this show, and I will continue to love their friendship.